5500 Market St, Wilmington, NC 28405 Good eats, good drinks, and great times is what JohnnyLukes KitchenBar is all about! JohnnyLukes KitchenBar serves Wilmington, NC a variety of 19 craft beers on tap, a hand selected eclectic wine list, fun cocktails, and of course exceptional food! Our two story layout brings the best of both worlds under one roof, downstairs at JohnnyLukes KitchenBar enjoy a nice meal with a glass of wine or head upstairs to JL's Loft for a burger and a cold beer (we recommend both!). So, next time you are looking for a new and exciting restaurant in Wilmington, NC, be sure to head over to JohnnyLukes KitchenBar and JL's Loft! One pound of wings served with celery and carrots. Choose your favorite flavor and dressing! Just like your momma use to make, except BETTER! A creamy blend of chicken, corn, peas, carrots, sweet onions topped with puff pastry. Paired with a house chopped or Caesar salad. Fresh sliced avocado, goat cheese, baby spinach and melted mozzarella on toasted French bread with JL’s homemade pesto sauce. An 8 oz. Topped with cheddar cheese, lettuce, tomato, red onion and a mustard-mayo mix. A rich and creamy soup of Atlantic Blue Crab, cream and Sherry. Spaghetti smothered with Luigi’s famous meat sauce and Certified Angus Beef meatballs served with toasted garlic bread. Paired with a house chopped or Caesar salad. An 8 oz. Loaded with cheddar cheese, barbeque sauce, onion straws, bacon, lettuce and tomato. An 8 oz. Topped with pepper jack cheese, fresh jalapenos, onion straws and sriracha mayo. New Zealand lamb chops marinated in a garlic orange mandarin sauce. Grilled and caramelized to perfection. Lightly seasoned tortilla chips with house made guacamole, pico de gallo and sour cream. Seasoned tortilla chips layered with in house slow-roasted North Carolina pulled pork or shredded chicken, house made queso, fresh jalapenos, diced tomatoes, black olives and scallions. House made creamy Parmesan Spinach and Artichoke Dip. Served pico de gallo, sour cream and lightly seasoned tortilla chips. Buttery, Kosher Brie baked in a golden light puff pastry topped with with your choice of jam. Served with apples, pears and toasted crostini. Sushi grade Ahi, seasoned and seared rare, topped with sesame seeds. Served with seaweed salad, pickled ginger, wasabi and JL’s signature soy sauce. JL's signature lump crab meat blended with cheeses and spiced to perfection. Served with toasted crostini. Sea scallops and shrimp wrapped in cajun candied bacon and served with a Thai Chili sauce. Baked with fresh tomatoes, basil, mozzarella cheese, and our house made pesto sauce. Drizzled with balsamic glaze. 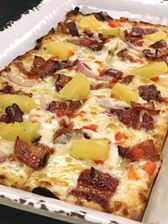 Baked with garlic, white cheddar, mozzarella, pineapple, bacon, red peppers and red onions. NC pork, slow roasted in house. Topped with sharp white cheddar cheese, red onions and BBQ sauce. Shredded chicken smothered in buffalo sauce, melted mozzarella and bleu cheese crumbles. Drizzled with bleu cheese dressing and topped with fresh scallions. An 8 oz. blackened chicken breast served over crisp chopped romaine hearts. Tossed in our bold, flavorful dressing and topped with Parmesan cheese and croutons. Chopped spring greens, red onions, cucumbers, red peppers, celery, tomatoes, Kalamata olives, bleu cheese crumbles, parmesan cheese and baked cinnamon pecans. Tossed in your choice of dressing. Spring mix with fresh beets and goat cheese, baked cinnamon pecans, dried cranberries and sliced pears. Tossed in Raspberry Vinaigrette dressing. JL’s handhelds are served with your choice of a side item. An 8 oz. Blackened and topped with caramelized onions, sauteed mushrooms, melted bleu cheese crumbles, lettuce and mayo. Topped with fresh avocado, sliced tomato, red onion and sriracha mayo. Certified Angus Beef top round, seasoned and slow roasted in house, topped with choice of cheese. Served on toasted French bread, topped with horseradish sauce and a side of au jus for dipping. Blackened flounder filet topped with cheddar cheese, lettuce, red onion and our house made remoulade sauce on a toasted potato bun. Sliced homemade meatballs on toasted French bread, topped with Luigi’s famous meat sauce, served open face with melted provolone cheese. Two soft flour tortillas filled with your choice of seasoned meat, shredded lettuce, house made pico de gallo, queso fresco and sriracha cream. Broiled jumbo lump crab cake, served with lettuce, red onion and our house made remoulade sauce on a toasted potato bun. Ham, Moho pork, genoa salami, swiss cheese yellow mustard and house made dill pickles. Served on a Cuban roll and pressed to perfection. Ronda Rousey "The Buff Chick"
Straight from Luke’s dad at Dockside Classics in Philly! Two oven-baked jumbo lump crab cakes, served with our house made remoulade sauce, romano cheese risotto and grilled asparagus..
12 oz Certified Angus Beef ribeye, grilled over an open flame and served with JL’s signature mashed potatoes and grilled asparagus. Flounder filet filled with crabmeat and baked in a lemon, garlic and white wine sauce. Served with mushroom risotto and our seasonal vegetable. New Zealand lamb chops marinated in a garlic orange mandarin sauce. Grilled and caramelized to perfection. Served with Romano cheese risotto and our seasonal vegetable. Sea scallops, shrimp, asparagus tips, onions, mushrooms and diced tomatoes. Tossed in our house made Creamy Pesto Sauce and fresh grated parmesan. Paired with your choice of a house chopped salad or Caesar salad. A fresh local 12 oz bone in rib chop, crusted with imported Parmesan. Oven roasted and served with JL’s signature mashed potatoes and our seasonal vegetable. Braised low and long in red wine and beef stock, JL’s tender braised Certified Angus Beef short ribs are pure comfort food. Served with JL's signature mashed potatoes and our seasonal vegetable. Blackened chicken breast, grilled shrimp and cavatappi pasta tossed with mushrooms, caramelized onions and spinach in a creamy house made Alfredo sauce. paired with a house chopped salad or Ceasar salad. Catch of the day, JL's jumbo lump crab cake, shrimp and scallops broiled in a lemon, garlic and white wine sauce. Served with crab fries and a house chopped salad or Ceasar salad.